Hundreds of people, water protectors, have peacefully gathered at the Camp of the Sacred Stone in North Dakota to support the Standing Rock Sioux Nation in protest of construction of the Dakota Access Pipeline. In response to protests, the state has retaliated with an increased show of force and violence against protesters. The police and National Guard are on the scene to protect the activity and property of a private corporation rather than the human rights of the Standing Rock Sioux and assembled allies. The pipeline was originally planned to tunnel beneath the Missouri River near Bismark, one of the most populated cities in North Dakota, but this route was abandoned when people identified that a rupture would threaten the local population’s drinking water. Now, the pipeline has been rerouted to go underneath the Missouri near the Standing Rock reservation, where the river is the primary source of drinking water, but the same threat persists. The actions of this private company, their security, and state officials are a reflection of the colonialism on which the US was founded and continue our history of mistreatment of Native Americans. It is a disrespect of a sovereign nation and in contravention of treaties signed with those nations. Extractive practices, from pipelines to fracking, have destroyed the lands of Native peoples and poor people in the US and all over the world. Not only do they bring about degradation of the environment but they also bring about, as we are currently witnessing, appropriation of state resources to protect private interests and violence against citizens. This must stop. Clean water and a clean environment are necessities of health and life, both basic human rights. The right to peacefully assemble is guaranteed by the U.S. Constitution and international treaties. The ongoing violence and long term threats the pipeline poses to the Standing Rock Sioux put in peril basic human rights that our government should be protecting. The People’s Health Movement–USA stands with the Standing Rock Sioux in demanding a halt of the construction of the Dakota Access Pipeline. Water IS life. And we call on everyone to stand in solidarity and support this struggle. 1. Call North Dakota governor Jack Dalrymple at 701-328-2200. When leaving a message stating your thoughts about this subject please be professional. 3. 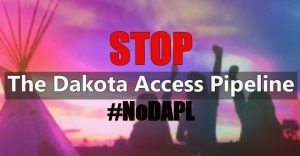 Sign other petitions, such as this change.org petition, asking President Obama to stop the Dakota Access Pipeline. There are several going around, and a strong show of support is vital! 6. Call the White House at (202) 456-1111 or (202) 456-1414. Tell President Obama to rescind the Army Corps of Engineers’ Permit for the Dakota Access Pipeline.